You are here: Home > What Is California Truck Rope? Before understanding what exactly sets California truck rope apart, it’s important to understand about the different types of industrial rope out there. Most rope can be broken into two categories: synthetic (manmade) fiber and natural fiber. In recent years, many people have gone with synthetic ropes because they are often more suited for the type of work and endurance necessary. While natural rope is softer to the touch and better holding up against direct sunlight and UV, it is also more prone to wear and rot. Generally speaking, polypropylene is the least expensive of the synthetic ropes and is known for being very lightweight but still strong. This is an economic choice that serves the majority of people who find themselves in need of synthetic rope for some type of a job. California truck rope is a very specific brand of polypropylene that offers the benefits nylon and polyester while keeping the inexpensive benefit of polypropylene. What makes California truck rope different? California truck rope is made specifically to pass the high expectations put forth by the California Highway Patrol Standards for tying down and hauling. 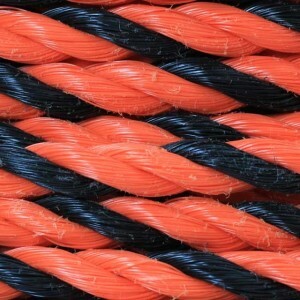 This means that this specific type of polypropylene rope not only has the same benefits as other polypropylene strands like resistance to mold, rot, mildew, chemicals, and road salts – but California truck rope has one huge advantage over most other synthetics: it has an ultraviolet inhibitor to help resist the sun damage issues that so many synthetic ropes have. 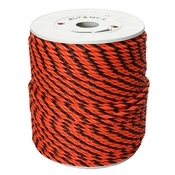 The most apparent difference between regular polypropylene rope and California trucker rope is the color: the three strand twist design features black and orange so it’s easy to differentiate from other synthetic ropes. California truck rope offers so many benefits, it’s great for non-trucking uses as well. Available in multiple sizes from a mere ¼ inch in length to a solid 1 inch, it can be a good choice for water and snow ski rope, pool rope, general utility rope, and more- any task that requires lightweight strength, floating abilities, resistance to abrasions, UV rays, water, road salts, and chemicals. Not sure which rope is right for your job? Give our sales team a call at 866-444-9990 – they’ll be glad to help.